You can easily customize your background using this software application. 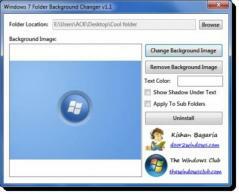 Windows 7 Folder Background Changer is an easy and convenient tool that allows to you change the background of Explorer folder in Windows 7. You can easily customize your background using your own favorite photos and wallpaper. The program even allows changing the color of the text and even showing shadows under the text that allows you to create ways to keep track of your files and sub-folders that stand out. It can goes farther by allowing you to change the background of your sub-folders.